is that Toyota 3tc the one that was out on Craig's list? Go with the 228mm flywheel ... you will be a lot happier with it if you can. my first swap was a Toyota 2.2R.. I did not want to mess with the computer either ... Never looked back... Now... Full blown water pumper with computers and everything. I have a few pointers.. that will save you time and money in the long run..
start out with putting the radiator up front in the air flow. its the only way it will cool right. if you don't, you will have radiator creep... or remove the rear window and mount it there seems to work. if you are going to start out with a type 1 trans... you will need to stay with the 200mm flywheel, don't go past a stage 1 presser plate with a cable cluch. How did you run the coolant lines to the front? If I run them underneath I would be concerned about crushing them on a rock, but I wouldn't want them running through the cabin either during the summer it got enough as is! we used copper pipe In one install.. it was nice because it had nice 90 and 45 to put on it. but it was week. if I had a cage I would weld it into part of the cage inside the cab ... it wont sweat that much heat... seen it done on a few rails.. just don't grab the pipe. or use 1 1/4 hose .. thick form somewhere like from Hose power run inside the cab. I run my heater lines inside my cab using 3/4 hose.. gets hot but I don't notice it unless I grab the line. on a simple Baja.. use Black pipe under the car.. the stuff can take a hit.. nice 90 and 45 right off the shelf.. run it on both sides of the tunnel all the way up to protect the pan. if you rip a hole in black pipe you have other problems.. its kinda heavy.. but ugly tuff. if you use black pipe have them thread them deep... Home Depot will only thread them a few turns ... I have to watch them and have them keep going until I get about 3/4" into the other piece.. I bought my own pipe threader because I was tired of running back to Home Depot.. I have had no problems with my radiator set up in the back. You can check it out here if you want. Thank you for the pic, I am planning on trying something really similar to what you did. What transaxle are you using? How do you put a link to a picture? Or upload pictures? I'm using a Bus Transaxle built by Dons Bus Box. It has racing gears in it for strength. You can check out my threads in Engines and Transaxles and also project builds. The best way I can figure out how to attach pictures is to upload them into the picture section of this site, then once you open them you can copy and paste the link like I did. I know there is another way but I do not know how to do it. come on up for the New Years campout.. This is the car I bought! Cool to find info on the build! I’m not sure how to post them is there a tutorial for posting pictures? 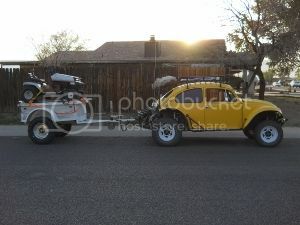 VW Volkswagen & Baja Bug General Discussion VW TDI Engine swap? 8 Grunt-0341 6713 VW TDI Engine swap?